In the integral model of recovery about which I’ve been writing in several recent blogs, founding theorist Ken Wilber (2012), and his student, John Dupuy (2013), provide a useful model using four different lenses for examining the costs inherent in what the American Psychiatric Association’s DSM-5 (2013) now calls “alcohol use disorders” (or, in less technical, more popular usage: alcoholism). As can be seen in the above diagram, we can view the costs of alcoholism from both objective and subjective perspectives, as well as on an individual vs. a collective basis. Thus laid out, the upper right-hand quadrant represents what empirical science can tell us about costs to the biological or medical functioning of the alcoholic individual (e.g., organ damage and neurobiological imbalances). On the other hand, the upper left-hand quadrant addresses the interiority, or subjective experience, of the addicted individual. Costs associated with this quadrant include how alcoholism stymies psychological and spiritual health and growth for the addicted individual. The lower right-hand quadrant explores objective factors affecting the addicted individual’s collective adaptation, or life in the world (e.g., financial difficulties and legal involvements). Here also are included various, objective economic statistics, indicating the literal cost levied nationwide by alcoholism: “If all the alcohol sold in the United States in 1999—605.9 million gallons of ethanol—were treated as if it had all been marketed as gallons of pure alcohol, the social cost would be $310.80 per gallon” (Kinney, 2012, p. 43). That is, the objective, social costs of alcohol are enormous. Reduced productivity in the workplace, tragically high traffic accident mortality rates, and disproportionate alcohol-related medical expenses shouldered by taxpayers are but a few of these ongoing costs to society, owing to untreated alcoholism. 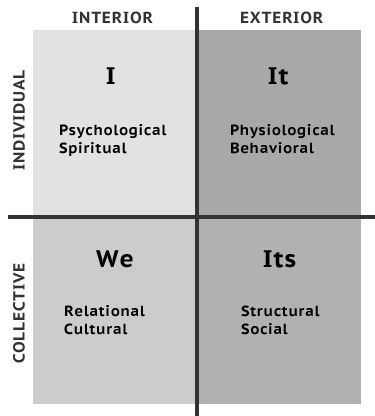 Finally, if we move to the lower left-hand quadrant, there we find the intersubjective dimension (e.g., family relationships, as affected by the addicted individual’s behavior). “For every person with an alcohol problem, it is estimated that four family members are directly affected, which means that approximately 80 million family members are touched by alcohol. In terms of which families are affected, those who are separated or divorced are more likely to report a family member with an alcohol problem. Those separated or divorced are three times more likely to report having had an alcoholic spouse” (Kinney, 2012, p. 41). Dupuy, J. (2013). Integral recovery (SUNY Series in Integral Theory) [Kindle version].